The palladium bull market flies in the face of what investors “know” right now. It began back in January 2016 and has not let up. After 22 months, it just hit a major milestone. The price is up 109% from its low and shows no signs of slowing. You see, palladium’s demand comes from automobiles. The gas-powered kind. Cars need nearly 80% of the world’s supply for pollution controls. Catalytic converters clean exhaust and reduce smog. That’s where all this metal goes. The thing is, everyone hates oil today. The price is low. Electric cars are taking over. You would think that if the world is on the brink of going electric, that should mean less need for palladium. Palladium is the anti-Tesla bull market. It shows us that someone still wants cars that run on gasoline, as you can see from the chart below. The demand for palladium drove the price up to a point that it hasn’t seen since 2001. That is, the price of an ounce of palladium now costs more than an ounce of platinum. This is an opportunity for investors. There are two major takeaways from palladium’s massive rally. 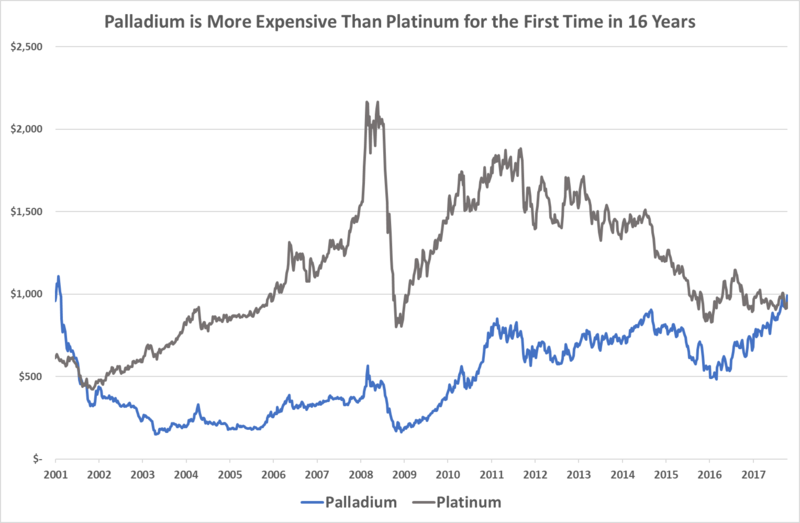 From 2000 to 2001, palladium was more expensive than platinum. During that period, the price of palladium exploded. It peaked at $1,110 per ounce. Platinum prices followed the price higher, but never got close to that high. Platinum peaked at around $620 per ounce. That means we should put on a palladium trade. If history repeats itself, we could make double digits on a palladium top. There are a couple ways to do that. The ETFS Physical Palladium Shares (NYSE: PALL) holds physical palladium. Its goal is to reflect the price of palladium. That makes it perfect for a pure palladium speculation. Another way to capture both the palladium run along with the expected rise in platinum prices is the Sprott Physical Platinum and Palladium Trust (NYSE: SPPP). Like PALL, SPPP holds physical platinum and palladium. SPPP holds 37,658 ounces of platinum and 84,854 ounces of palladium. That means its assets are 70% palladium to 30% platinum. We can benefit from the strong climb in the palladium price, while being open to a future bull market in platinum. Either of those funds will work for a palladium speculation. However, the bull market in palladium also tells me that oil demand is still growing. More cars equal more oil … but that’s an idea for a different essay.